Toy Nippon: BBTS News: Star Wars Black, Breaking Bad, Transformers Masterpiece, ARH Statues, DC, The Hobbit, Aliens & More! 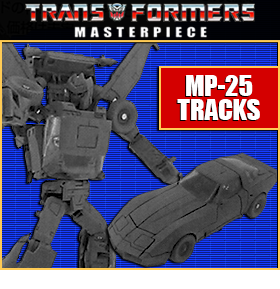 BBTS News: Star Wars Black, Breaking Bad, Transformers Masterpiece, ARH Statues, DC, The Hobbit, Aliens & More! 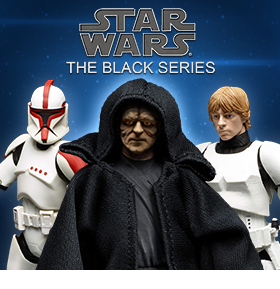 The newest figures to the 6" Star Wars Black series have just gone up for preorder. 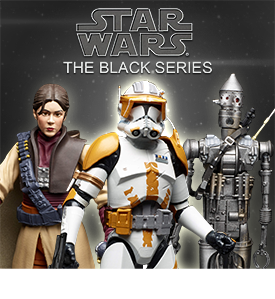 Series 02 brings you Clone Commander Cody, Episode V IG-88, and Episode VI Leia in Boushh Disguise. These awesome figures are available in a case of 4 for $79.99; a set of 3 for $69.99; and individual listings for Commander Cody at $19.99 and Leia in Boushh Disguise for $25.99. 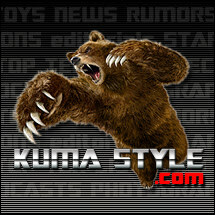 We just listed a bunch of cool new items from Bandai Japan! Check out S.H. Figuarts Kamen Rider Marika Peach Energy Arms Exclusive for $89.99 and Kamen Rider Zeronos Vega Form Exclusive for $99.99. Get your hands on a 1989 Batmobile or Millennium Falcon Crazy Case to hold breath-mint tablets for $49.99 each. We also have the SDX 3rd Gundam Dai Shogun Exclusive for $164.99. Medicom celebrates the enduring creativity of Disney with series 04 of their Disney UDF (Ultra Detail Figure) line-up. Disney collectors will find impressive versions of Buzz Lightyear and Woody (from the Toy Story trilogy), Agent P and Perry the Platypus (from the Phineas & Ferb cartoon), and Band Leader Mickey Mouse, all sculpted in PVC and in window box packaging. "Do you want to build a snowman?" It might be easier (and warmer) to just preorder your very own Olaf VCD (Vinyl Collectible Doll) by Medicom! This adorable vinyl version of the magical talking snowman from the hit Disney film Frozen is just over 5" tall and sculpted in his signature sitting position with a huge grin on his face. Monster High has announced a few new series of figures including some brand new characters to add to your collection! Find Freak Du Chic and Boo York Boo York series in sets of two, three or four and also listed individually. We just added Ghoul Fair in a set of 4 and individually; and we also have several two-packs and play sets available. Top it all off with a cool new six-pack of the original core dolls and a 17” tall Gooliope Jellington! This Titan figure is fully transformable and stands just over 8” tall in robot mode. The figure is made of plastic with some die-cast parts and features light up eyes and a changeable face. It also includes a non-transformable Magnuz figure that stands about 3” tall. Iron Man Mark I is the latest to join the Egg Attack line. Standing at 8” tall, this cool little figure features a light up chest effect. If you purchased the awesome Fan’s Project Intimidator combiner figure and feel like it is just missing that ‘something’ extra, then you need to get your hands on this D-06 Upgrade Kit from DMY Studio. Whether a fan of superheroes, card games or puzzles, you will love these new listings from Aquarius Posters. Spend a rainy day putting together the 1000 piece puzzles of Batman 1966, Harley Quinn, and the Justice League. Play a few rounds of Go Fish, Old Maid, or Hearts with the DC Bombshells, Marvel Villains, Spider-Man or Guardians of the Galaxy card decks. Or answer Gotham’s call for justice on your next family game night with the Batman Road Trip Game. These plush versions of Krypto the Super-Dog and Streaky the Super-Cat are direct from the pages of Art Baltazar’s children’s book series ‘Super Pets’. Kids and collectors alike will love making their room more super with these velvety soft plush animals. Assemble your Avengers for an All-Star smack down! The 3.75” All Star Figure series continues with this new assortment. This case of 8 includes one each of Iron Man, Hulk, Iron Legion, Loki, Marvel’s War Machine and Scarlet Witch, and two of Ultron 2.0. Build your own winged Hobgoblin figure with the parts that come with these cool Marvel Legends Infinite Series figures! Collect all 6 pieces to build the villainous criminal mastermind, Hobgoblin when you purchase either case assortment for $159.99 or the set of 6 that includes Classic Spiderman, Daredevil, Anti-Venom, Spiderman 2099, Warriors of the Web Spider-Girl, and Warriors of the Web Spider-Woman for $139.99. Now your 1/12 scale figures can enjoy one of the most classic arcade games of all time: Hang-On, the realistic motorbike racing game! It’s just over 6” long and assembles easily with snap-fit parts; stickers are included for the markings and different monitor displays. This adorable, pre-painted figure is approximately 4” tall and comes in Twinkle Ribbon or Cutie Ribbon versions. Cutie Ribbon is pointing and giving you a wink and Twinkle Ribbon is holding a microphone and waving at you. Each figure is in a pink, white, and yellow outfit with long purple pigtails and a giant pink bow in her hair. The frosty princess Elsa from Disney’s hit film Frozen is now in the 7” PVC Premium Figure size by Sega. These Premium Figures are typically found in mechanical crane machines or other games of skill in Japan, but you can order this rendition of Elsa from the comfort of your home or office. This plastic and diecast Metamor-Force Dancouga figure stands almost 9” tall and is super poseable. It features both a 3-stage transformation for each beast (Eagle, Liger, Cougar, and Moth) and the combined mode. The figure includes the Daigan beam cannon, Dankuken sword and the transformable flying booster, as well as three guns and a roaring head. This 12” figure steps straight out of the comic book and comes with such a ridiculous number of accessories and details, it’s nearly impossible to list them all here! He has a full set of tactical gear and clothing, guns, knives, patches, a life-like head sculpt, hands, and even a cigar! This guy is fully equipped to find the source of the terrible plague sweeping across the globe. We have the regular version listed at $169.99 and the Dead Unit (Zombie head) exclusive version for $199.99. We also have his HK416c Rifle Exclusive accessory set to complete his arsenal for $49.99. Help Jack Burton and the lawyer Gracie Law rescue his kidnapped girlfriend from the evil Lo Pan and his martial arts fighters with the Big Trouble in Little China ReAction 3.75” figures. We have Gracie Law, Jack Burton, Lightning, Lo Pan, Rain, and Thunder and also the cute, stylized Pop! versions. The crew of the Enterprise has beamed up to the Pop! lineup with Captain Picard, Will Riker, Data, Worf, Deanna Troi and Locutus of Borg all in stock now. One of the most deadly Category IV kaiju, Otachi is capable of flight, and can spit an acid corrosive enough to melt everything from office buildings to the armor of a Jaeger! This massive, ultra-detailed figure measures nearly 18" long and almost 7" tall, and is to scale with the Jaeger action figures. Featuring over 30 points of articulation and an interchangeable tongue and sculpted "acid spitting" effect, this epic fan-demanded figure is in stock now. Rocky is the fifth figure in the highly successful line of classic 8-bit video game tributes. This fully articulated 7” tall figure comes with a removable American flag that can be draped over his shoulders. Rocky comes in a special window box package that recreates the look and feel of the classic 1987 video game packaging. This Rambo figure stands 7” tall with over 25 points of articulation so you can create awesome fighting poses. He comes packed with a rocket launcher, knife, grenade, and bow-and-arrow set. The paint deco takes a stylized approach to reproduce the game’s original cel-shaded look. The Marvel Bishoujo collection continues with the perpetually youthful mutant and sidekick to Woverine, Jubilee! Her most iconic look is now captured in fantastic Bishoujo style by sculptor Gotaro Takeuchi, and is based on a new illustration by master artist Shunya Yamahita. This spunky 1/7 scale statue includes a special set of interchangeable techno glasses. Designed by Yoji Shinkawa, REX stands on massively armored legs and wields a huge rail gun in addition to Gatling guns, missiles, and a laser. This model kit stands nearly 9” tall and is comprised of 600 pre-colored pieces. It is recommended for experienced model builders and includes four 1/100 scale figures of game characters. The next beautiful Ani Statue is Sinon, from Sword Art Online II Phantom Bullet story arc. This deadly sniper is presented in her unique green jacket and pants with a long flowing white scarf. Her intense blue eyes match her hair and she is holding her trademark sniper rifle as she floats above her rubble display base. You’ll definitely feel safer with this beautiful elite sniper watching over your collection. Based on the bold and striking appearance of his black and blue colored weapon, these chopsticks also include the samurai’s design on the pommel and hand guard. As a special bonus, a chopstick stand featuring the Kato family crest is included. The chopsticks are 9” long and fully safety tested. We have a bunch of new Funko items in stock from the Pop! 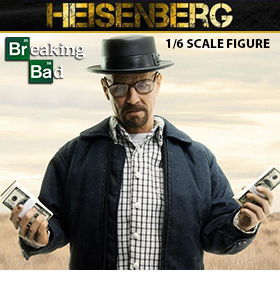 Breaking Bad Crystal Ship and Heisenberg figure, to Pop! Star Trek the Next Generation, and Big Trouble in Little China ReAction and Pop! figures. Throw in some Pop! TMNT keychains, and a variety of other Pop! figures and Wacky Wobblers to complete your collection! Just like they were when you were a kid, only BIGGER! Check out the latest additions to the vintage Kenner-inspired Star Wars Action Figure line with Luke Skywalker in his Hoth Battle Gear and Bespin Fatigues. Both figures are faithfully reproduced from the 3 ¾” Kenner Originals and include accessories. Now you can have your very own jumbo sized Imperial Tie Fighter Pilot! This fully articulated jumbo sized figure is faithfully reproduced from the original vintage 3 ¾” Kenner figure and even comes with a gray Pilot Blaster! Avengers Assemble! The first series of 2015 in the 3.75” Infinite line includes Bishop, Big Time Spiderman, Black Cat, Classic Sandman, Sandman, Blue Beast, Grey Beast, Hawkeye, and Daredevil. You can get these great figures in a set of 9 for $134.99, the case of 12 for $149.99 or you can get Big Time Spider-Man, Classic Sandman or Blue Beast individually for $12.99 each. Interpreted in 3d by sculptor Ruben Procopio from an original drawing created by Garfield creator Jim Davis specifically to inspire the piece, this 13” tall gallery edition statue captures Garfield in all his self-indulgent glory. Hand crafted in heavy weight poly stone the Gallery Edition statue is a numbered limited edition of 500 pieces and includes a numbered plaque, certificate of authenticity and booklet. This very special signature series includes a plaque that has been personally hand signed by Jim Davis himself. These charming and quirky 3.5” tall figures by Quantum Mechanix come with a unique white-board speech bubble and a branded Q-Pop marker, allowing you to write in your own phrases or sound effects. Batman is surveying his city for criminal activity from a gargoyle high above Gotham, and Catwoman is swiping sparkly jewels with the help of her feline friends. Straight out of his dream sequence in Disney's Frozen, comes the Pop! version of Summer Olaf complete with sunglasses and a beach ball. Celebrate the 60th anniversary of Godzilla with these 6" tall soft vinyl figures from the Godzilla Movie Monster EX line. We have King Ghidorah, Godzilla 1968, Mecha Godzilla, King Caesar, and Rainbow Mothra all in stock now.